Anyway to remove DRM from Apple Music downloaded songs? I have subscribed to Apple Music and downloaded a lot of songs for offline listening. However, I can’t transfer them to my MP3 player and car player since they are in DRM-protected M4P format. Anyone can tell me how to remove the annoying DRM from Apple Music songs? Apple Music is a popular music streaming serivice with 45 million songs. It allows you to stream anything in the collection on all Mac, Windows, iPhone, iPad, Android, etc. ad-free. If you have also met the above problem, here is the right solution. To play Apple Music songs anywhere you want, you just need to remove the DRM protection with a professional Apple Music DRM removal tool. Here I recommend you Apple Music Converter for Mac and Apple Music Converter for Windows. 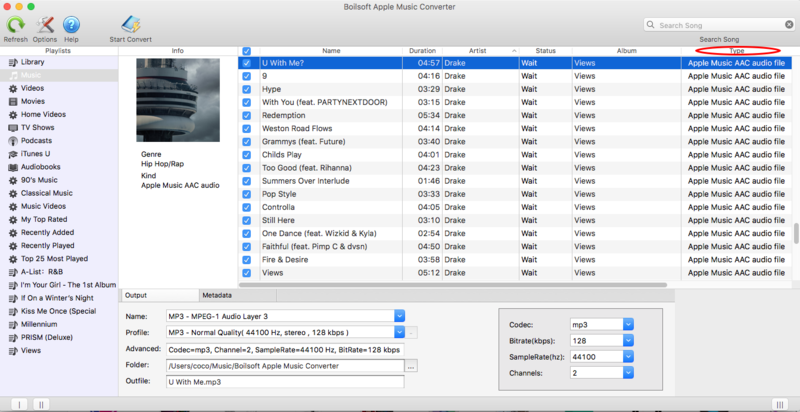 Boilsoft Apple Music Converter is professional Apple Music DRM removal software that enables you to easily remove DRM from Apple Music songs and convert M4P to MP3, M4A, etc. You don't even need to download the Apple Music songs. Follow below steps and learn how to remove DRM protection from Apple Music songs on Mac or Windows. 3. On Boilsoft Apple Music Converter interface, you will find all you Apple Music songs and playlists, together with iTunes songs, movies, TV shows, audiobooks, etc. There is no need to download Apple Music songs to your Mac/Windows. Just add Apple Music songs, albums or playlists to iTunes Library. Boilsoft Apple Music Converter will load them from iTunes and show them on the interface. Select Music on the left column and sort all songs by Type. Songs from Apple Music are marked as Apple Music AAC audio file. Apple Music playlists that you added to iTunes Library are shown on the left column. Click the playlist name and all songs it contains appears on the right side. Click the checkbox before the Apple Music songs you want to remove DRM from. You can also search the song name you want with the searchbox on the right top corner. 4. Choose output format (MP3, M4A, AC3, AAC, AIFF, AU, FLAC, M4R or MKA), customize output song bitrate, sample rate, name format if you like. 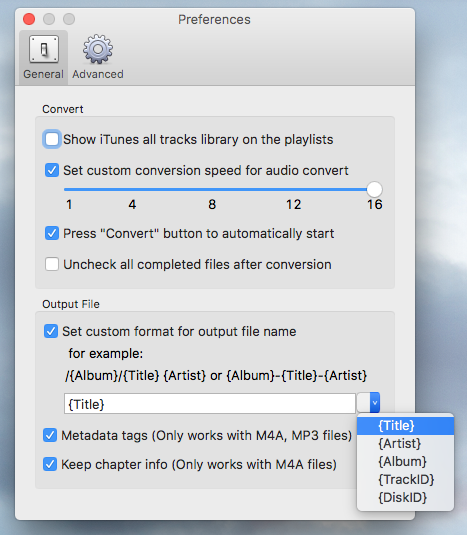 Boilsoft Apple Music Converter provides several profile settings for each format. If you are not satisfy with them, customize the value on the right side. The name can contain Title, Artist, Album, TrackID and DiskID. All output DRM-free Apple Music songs will be named with the format you set. 5. Click Start Convert button and you will get DRM-free files after conversion. Useful Tips: Movies and TV shows purchased from iTunes Store are also DRM-protected. If you want to remove DRM from iTunes movies and TV shows and convert M4V to MP4, try this iTunes Video DRM removal software - iTunes DRM Media Converter.